Ten Terrific Recipes for Instant Pot Turkey Breast features recipes for a quicker way to cook a turkey breast via the Instant Pot or Pressure Cooker. Make one of these delicious recipes for Thanksgiving when you have a smaller crowd, or just enjoy turkey dinner any time you want a quick meal! Click here to PIN Ten Terrific Recipes for Instant Pot Turkey Breast! 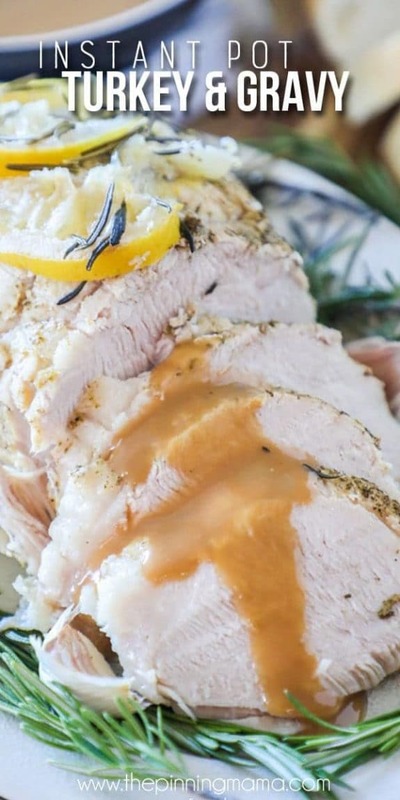 Click to see the Top 10 Recipes for Slow Cooker Turkey Breast! For years and years I’ve been a fan of slow cooker turkey breast, and that recipe collection has been popular on this site. But now that I’ve tried turkey breast in the Instant Pot, I am a huge fan of that method as well. Turkey turns out so moist and delicious in the Instant Pot! And if you haven’t tried it yet, we hope one of these Ten Terrific Recipes for Instant Pot Turkey Breast will entice you to grab a turkey breast and give it a try! Of course slow cooker or Instant Pot turkey breast is a great idea for Thanksgiving when you have a small crowd! But turkey dinner is way too tasty to only serve it once a year. Even with the time to come to pressure and release pressure, Instant Pot turkey breast is still quick enough for a week-night dinner, and if you’re lucky enough you might have some leftovers to make turkey soup! All photos are copyrighted to the blog that posted the recipe. Just click the recipe title under any photo to see the complete recipe on the original site. And enjoy! And check out our Slow Cooker or Instant Pot Thanksgiving recipes below if you’re ready to start thinking ahead to the holidays! Using the slow cooker or Instant Pot can really free up stove space for a holiday meal! This Instant Pot Turkey Breast Recipe from Crunchy Creamy Sweet is so juicy and cooks in just 35 minutes! You can choose your cooking method with this recipe post for CrockPot or Instant Pot Turkey Breast with Lower-Carb Gluten-Free Gravy from Kalyn’s Kitchen and this post has all my tips for adding flavor to the turkey. 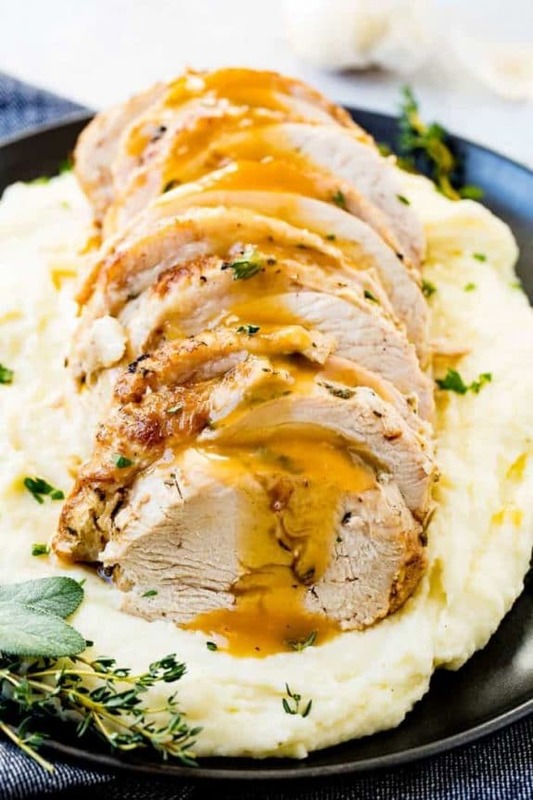 Instant Pot Turkey Breast with Garlic-Herb Butter from Eatwell 101 uses a quick broil to get it nicely browned. Top with the delicious gravy made from that garlic-herb butter flavored drippings! This Instant Pot Turkey Breast Recipe from The Cookie Rookie just might change the way you do Thanksgiving! This is a foolproof way of cooking an amazing, juicy turkey breast in much less time. 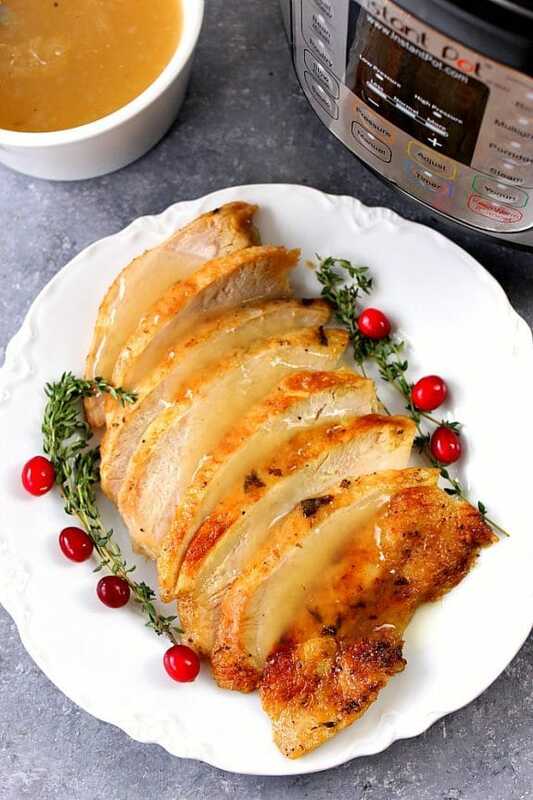 This super easy Instant Pot Turkey Breast from Jo Cooks sears right in the Instant Pot which gives a nice browned color that everyone loves. Those turkey drippings make a delicious gravy, and everything is made in one pot. Instant Pot Turkey Breast Potato Dinner from Simply Happy Foodie is a dinner you can enjoy any day of the week! It’s a perfect Thanksgiving dinner for a small gathering too! 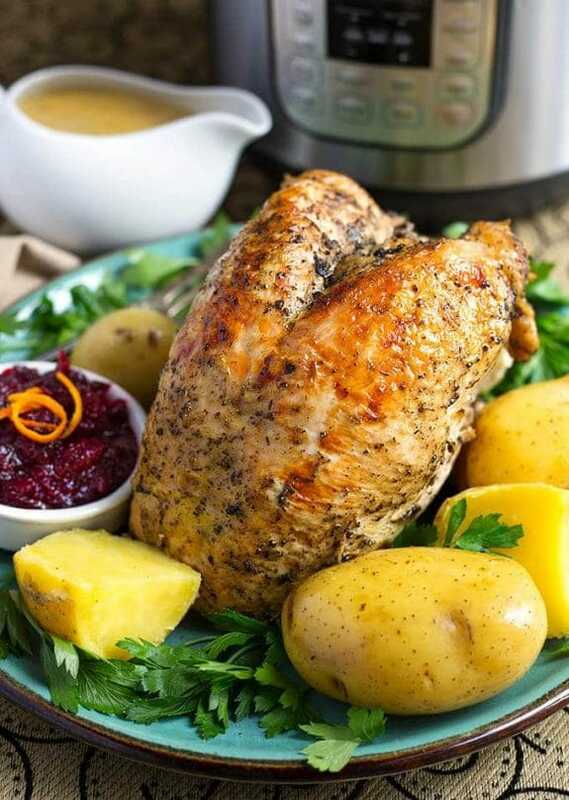 Pressure Cooking Today presents Moist and Tender Pressure Cooker Turkey Breast! You can have this juicy, tender turkey on your table in very little time! 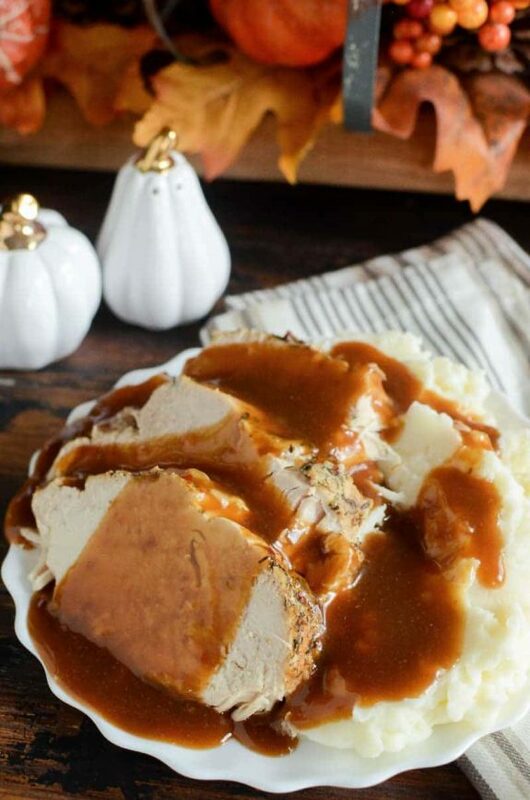 Instant Pot Turkey Breast & Gravy from The Pinning Mama is fool-proof to giving you juicy, tender turkey every time! You can even start with a frozen turkey breast, and end with a moist and tender meat to serve for dinner. 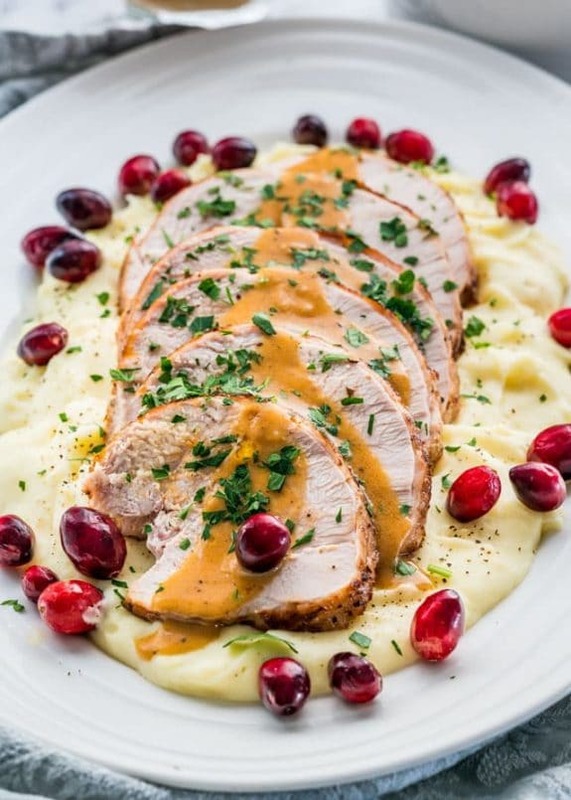 And one more, and this Award-Winning Instant Pot Turkey from Oh Sweet Basil sounds just amazing! 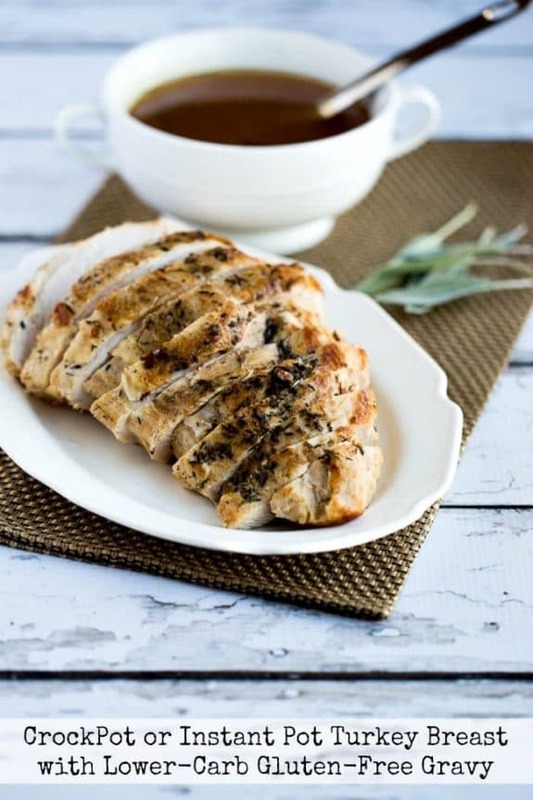 Have you made turkey breast in the Instant Pot? Let us know in the comments about how that went for you!